The Outwell Camp Bed Sleep System offers outstanding camping comfort packages inspired by our sustained commitment to innovation. Purchased this having gone though 100s of airbeds that have lost air overnight. 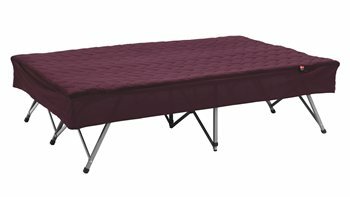 Took a couple of nights to adjust to but this is a comfortable, sturdy set up that allows you to be off the ground (warmer and easier to get out of) and with the added extra of a mattress. Wouldn't go back now! One person can unfold the bed but it's easier with two. We placed castor cups under the small feet to stop them sinking in the ground. Care has to be taken when folding up the bed to make sure the fabric doesn't foul the hinges. All in all, not a bad night's sleep! We’ve had loads of air beds and decided to upgrade! Best thing we’ve purchased to make camping more comfortable.